Growing up from the small town in Uttarpradesh — North India, in the middle class family whereas his father was an engineer in Uttarpradesh Government service. His passion towards music reminded him to wake up with inspiration to do something different in life. Prashant Chauhan, born to do more, to do great, and be different. He admired news catalogs from the market when the seller wrap on the goes that he bought. ‘I told myself, I want to be that man that makes impact via singing in live shows’, he recalls. Everyone faces insecurities and other challenges. Prashant did too. But he wanted to redefine it, and encourage people to understand their hidden talent. “He always talks about the worth of family and friends, and striking a balance between work and life,” to inspire others. His determination made his unique. A Singer, Music- Composer, a Rocking Stage Show performer, Cinematographer, Film editor.He is MBA post-graduate, master degree holder from Welingker Institute of Management & Research, Mumbai.He has done various stage shows in childhood days with great personality of film industry like Annu Malik, Dabboo Malik, Salman Khan, Govinda, Anoop Jalota etc. First winner of first children special episode of TVS-Sa Re Ga Ma released in Nov 1995 on Zee TV at the age of 10. His selection in the show opened the door for other talented kids across the reality shows across the channels afterwards. His Children Special-29th Episode was a blockbuster hit at that time and repeated 3 times on public demand. Also performed in 1997,1999 and 2001 in Saregamapa. Prashant recalls, learnt music from Padma -Bhushan Ustad Ghulam Mustafa Khan, a legend in Indian classical music landscape who is also Guru of legend singers & musicians like Asha Bhosle, A.R.Rahman, Sonu Nigam, Hariharan, Shaan & Amit Kumar. After winning Saregamapa, Zee TV Chairman Mr. Puneet Goenka (Son of Subhash Goenka) has signed 5 years contract with Prashant for stage shows and music albums with Zee TV. Winner of “Taza Geet Bahar”- All India level singing competition organized by T-Series, Mumbai in front of Late Gulashan Kumar, Usha Khanna, Sukhvinder,Anuradha Podwal at the age of 9. During his childhood, at the age of 11 — he has given interviews in well known TV show “Surabhi” with Siddharth Kak & Renuka Shahane on DD-1 (1996) also performed in “Little Wonder Show” organized by Kalyanji-Anandji, famous music director duo of golden era of Bollywood music. Limca Book of World Record holder for performing on almost all the popular channels running during 1995–96. His first music video song Wo Meri Deewani Hai was released on his youtube channel on 29th Jan’2016. 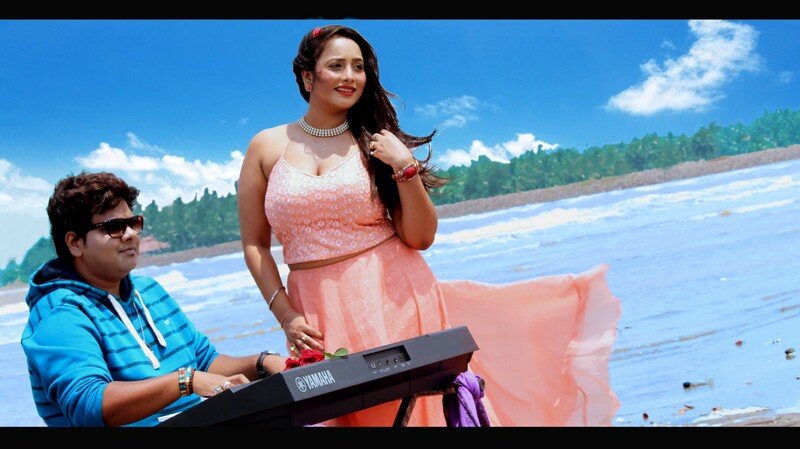 His 2nd music video Chori Chori was released on 3rd June’2016 on youtube channel “Worldwide Records India” with famous regional actor Rani Chatterjee. His upcoming project is “Hausla Aur Raste” , a short Bollywood film as a chief editor, cinematographer, music — composer. We had a candid interview with Prashant Chauhan and the energetic singer, speaks about his released album, his single ‘Chori Chori’, and his future plans for the music industry! 1. Tell me about song? Prashant : CHORI-CHORI is a pure romantic & refreshing song. The concept of the song is all about 2 best friends — a boy played by me & a cute girl played by Rani. The boy is in love with the girl but not able to express his sentiments with her. How their friendship gets converted in to Love, watch the song to know about it! You will easily connect with the song due to its melody, rhythm, lyrics & the way it is presented! The song is composed by Vishal-Prashant-Vijay and written by Vijay Kumar. Vishal and Vijay are my elder brothers. The song is produced by VPV Productions. 2. What you have done earlier? Prashant : I am the first winner of first children special episode of Zee TV Sa Re Ga Ma Pa which was telecasted in 1995. I performed in Sa Re Ga Ma Pa in 1997 & 2001 also. I have also won the India level singing competition “Taza Geet Bahaar” organized by T-Series in 1995.Late Gulshan Kumar ji appreciated me personally&promised me to do something in future. However, nothing could happen due to his sudden demise. After that I took a break due to some personal reasons and completed my MBA and started working as an accounts and finance manager in a private company. After about 20 years, I released my first Single “WO MERI DEEWANI HAI” in January 2016. You can watch it on our YouTube channel — “VPRASHANTV MUSIC”. “CHORI-CHORI” is my second Single! 3. Who has written and composed this song? Prashant : CHORI-CHORI song is written by Vijay Kumar and composed by Vishal-Prashant-Vijay. We all 3 are real brothers and I am the youngest among three. 4. Who is the director of this video? Prashant : This video song is directed by my elder brother Vijay Kumar. 5. Have you thought about acting in future? Prashant : I am an artist. Music is my passion.I love singing & performing on the stage. I do compose music with my elder brothers Vishal & Vijay, I do music programming & arrangement as well. So music is my passion and priority. But in future if I get good offer for acting I would be happy to do it. 6. Which place do you belong to? Prashant : My family is originally from Uttar Pradesh. My father was in UP State Government service. But since childhood, I am in Mumbai for study and music. Prashant : Rani Chatterjeeis already a very well-known face in Bhojpuri Cinema. She is No#1 actress in Bhojpuri industry.She is my childhood friend also. Rani is a highly talented & versatile actress.Her dedication, hard-work& energy level is quite amazing! During shooting of CHORI-CHORI, she never made me feel that she is a big star. She has done a fantastic job in the song. 8.Have you got any offer after this song? Prashant : Some music projects are in pipeline. We will announce at the right time. 9. What is new in this song? Prashant : CHORI-CHORI is a melodious and refreshing song which has a sweet love story of two best friends.And, of course, this is the first Hindi Single of Rani Chatterjee! 10. Who is your ideal? Prashant : Kishore Kumar is my favorite singer. He was very versatile! In music composers, R. D. Burman is my favorite. He was 20 years ahead in his music. He created today’s music in 70’s. You can see many songs of him have been remixed too! 11. What’s your future plans? Prashant : I would like to become a successful playback singer. Also would like to contribute as a music composer with my elder brothers for Bollywood movies. Recently we have opened our own production house ‘VPV Productions’. Prashant : I am very lucky to have such a great father who had given me full support to make my career in music industry?My mother has worked hard and sacrificed a lot so that I am able to work in Music. I got opportunity to learn Music from my Guru Padma-Bhushan Ustad Ghulam Mustafa Khan Sahab, I won first children special episode of Zee TV Sa Re Ga Ma Pa and some other competitions because of my parent’s efforts and blessings. I must say that music is my parents’ dream first which I am fulfilling! Apart from my Mom and Dad, my elder brothers & wife have always been encouraging me! 13.How you have thought about this song? Prashant : I have already mentioned that we have launched our Production — VPV Productions and its YouTube channel VPRASHANTV MUSIC with our first Single — WO MERI DEEWANI HAI in January 2016. Our aim is to create great music for the music lovers! CHORI-CHORI is one more step towards the same direction! 14. Why you have thought to take Rani Chatterjee in this video? Prashant :Rani is my childhood friend and we had a plan to work together and once we started working on CHORI-CHORI, we offered her and Rani joined the project! As per demand of the script of the song, we wanted a young bubbly girl and Rani is the best fit for it! Originally published at www.filmibeat.com on May 3, 2016.